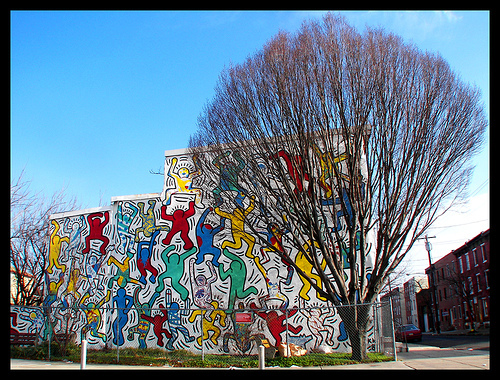 Just three years before his death – and two years shy of his 30th birthday – pop artist Keith Haring visited 22nd and Ellsworth in South Philly to paint one of his iconic murals, “We the Youth.” The PA-born artist (Haring grew up outside of Reading and briefly attended Kutztown University) was already one of the most famous American artists by the time he began his mural project here. Inspired by his radiant babies and lyrical, almost child-like figures that that first decorated the New York City subways before catching the attention of the fine art elite, the 25-year-old mural had suffered the ravages of time and weather, and was in desperate need of care or risked being lost forever. When the chance came to save this mural, the foundation worked closely with Mural Arts. “The mission of the Keith Haring Foundation is to sustain, expand and protect the legacy of Keith Haring, his art and his ideals. The foundation supports not-for-profit organizations that assist children, as well as organizations involved in education, research and care related to AIDS and HIV,” says Gruen, who was a personal studio assistant to Haring in the late 1980s. Many of his family members – who still reside in PA – are still active with the foundation. And she says Mural Arts was a natural choice to help make pop art history a second time. View our Keith Haring collection here.